Nuance has just announced the next major version of its Mac dictation software, Dragon Dictate 4. The new version improves recognition accuracy as well as several new features, including the ability to machine transcribe from a pre-recorded audio file. You no longer have to be recording a voice live to get transcription. With interest in speech recognition at an all time high, Nuance has today announced Dragon Dictate for Mac 3, the latest version of its desktop speech recognition software for the Mac. Dragon® Dictate® for Mac® 2.5 allows users to enter text and control their Mac by voice instead of using a keyboard and mouse. Turn ideas into text at the speed of thought so you can communicate more freely and persuasively. Just say words and watch them appear on the computer screen. Tell your Mac what to do and it obeys your commands. 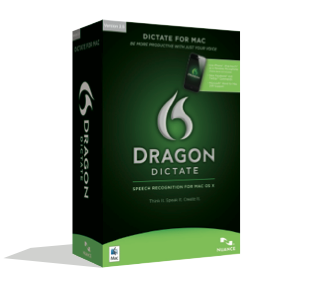 At the EssentialMac.co.uk we use Dragon Dictate as a matter of course when reviewing. Personally I find that it helps articulate thoughts and ideas without the confines of a keyboard. Nuance Dragon Express, an attempt to bring Siri to the Mac? It seems that the age of speech recognition has been set alight by Siri. Vlingo might have been getting all the attention recently as an alternative but Dragon Apps have been around a lot longer but with reduced functionality. Dragon Dictation for Mac is a favourite app on the Mac for me right now so my ears pricked up when I came across Dragon Express. Continue reading → Nuance Dragon Express, an attempt to bring Siri to the Mac? It was many years ago that I first used the speed recognition software Dragon Dictation. Upon hearing about the world of speech recognition this was the making of a boy hood dream coming try, being able to tell my computer to do with the power of my voice alone.